Here is a card I created for my collegue's birthday. I have used paper quilling technique here. Cut 3 windows on the front of the card, so that it reveals the inside of the card. You can use a different color paper inside so that it reveals nice texture when viewed through the windows. and create some interesting designs using paper quilling. 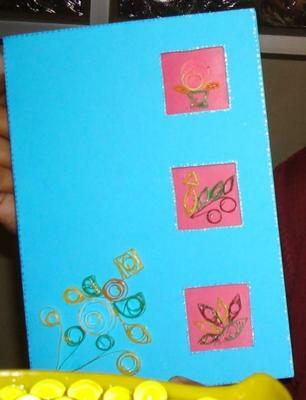 I have also decorated the front of the card with quilling.